Glacier Chiropractic provides effective herniated disc and pinched nerve treatment in Ballard, Seattle. Bulging and herniated discs affect thousands of people across North America. Our office uses an integrated approach to diagnosing and treating back problems resulting from living with the pain of a pinched nerve due to a disc injury. Helping our patients live productive and pain-free lives is a valuable part of our mission. Call the skilled and caring providers at Glacier Chiropractic to schedule your first appointment. 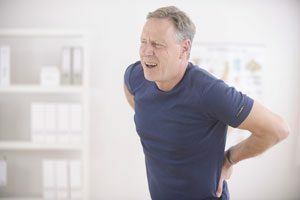 In many cases, disc herniation is the result of gradual wear and tear that naturally accompanies aging. This process is called disc degeneration. With age, your spinal discs become less flexible and more susceptible to rupture due to a loss of water content. The loss of water content can become problematic since the discs in your spine act as the cushion between your vertebrae. A herniated disc can also be created by an injury that causes sudden jerking movements such as a car accident. One additional cause is the combination of the ones mentioned above. In this case, degeneration has weakened the disc so completely that a mild injury can create a problem. Surgery can be a last resort when all other options have proven ineffective. This is the case in about 10% of all patients suffering from a herniated disc. Bulging discs can cause debilitating back pain, but a great many individuals that suffer from a bulging disc have no pain at all. A bulging disc simply protrudes outside of its normally occupied space between the vertebrae. Although a bulging disc is more common than a herniated disc, a herniated disc is more often associated with pain. The treatment of a bulging disc depends on the symptoms. Many people suffering from a bulging disc can manage their symptoms without undergoing surgery. Treatment plans may include the use of pain medications or physical therapy as a less invasive option to surgery. Don’t suffer one day longer. We have affordable rates, and walk-ins are welcome. Returning patients have the choice of selecting a multiple visit bundle that reduces the price per visit. Trust gifted hands at Glacier Chiropractic.